Equicast is rigid enough to protect and stabilize weak, damaged tissues, yet allows the hoof wall to flex, stimulating blood flow. Because it’s held in place by adhesive instead of nails, it doesn’t compromise hoof wall and internal tissues with nail holes and stress points. Equicast stabilizes loosely connected or weak, poor quality hoof wall, distributing stress away from damaged areas and allowing your horse to grow a straighter, better-connected hoof wall and a stronger, tighter white line. Equicast can fulfill the same therapeutic functions as hoof boots, but doesn’t come up over the coronet – so there’s no risk of rubbing or bruising, and no need for the daily maintenance often required when using hoof boots for turnout. Equicast is porous, allowing excess moisture to drain away and evaporate, and it does not cause heat buildup under most conditions. Because Equicast is porous, disinfectant treatments for thrush, abscess openings, white line disease, or penetrating founder can be applied right through the cast by soaking. If direct application of medication is needed, a hoof knife can be used to cut an opening in the cast, exposing the affected area. Adding a reinforcing wear rim of plastic can double the life of a cast. How long does Equicast last? An application of Equicast may last for four or five weeks or even longer, though two to three weeks is more common. A horse in rehab care, who isn’t moving around much and lives in a soft-soil grassy pasture, might wear the same set of casts for four or five weeks – while a half-hour of walking on asphalt, concrete, or rock dust might wear a cast through. Cast life can be extended by the addition of Superfast plastic wear rims, which can wear away and be replaced over and over. Can Equicast be used with padding? Equicast with padding can help a foundered horse stand and move comfortably. Equicast can be used with a variety of materials and shapes of padding to increase your horse’s comfort and encourage him to move with a free stride and a heel-first landing. 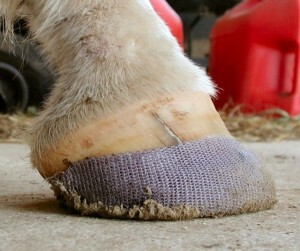 Padding is especially recommended for Equicast applied to thin-soled, laminitic, and foundered horses. Dental impression material, Equipak CS pour-in pads, ThinLine pads, and Vibram are all supportive, resilient materials that can be used with Equicast to provide your horse with a comfortable place to stand and move. Vibram pads with toe cutouts provide airspace underneath thin sole at the toe, while allowing your horse to comfortably bear his weight on the back of his foot. 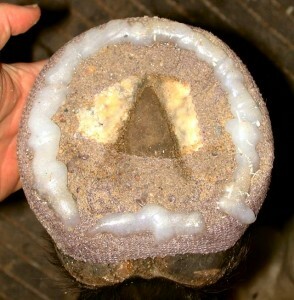 This technique can help horses that are thin-soled, or foundered, or both. 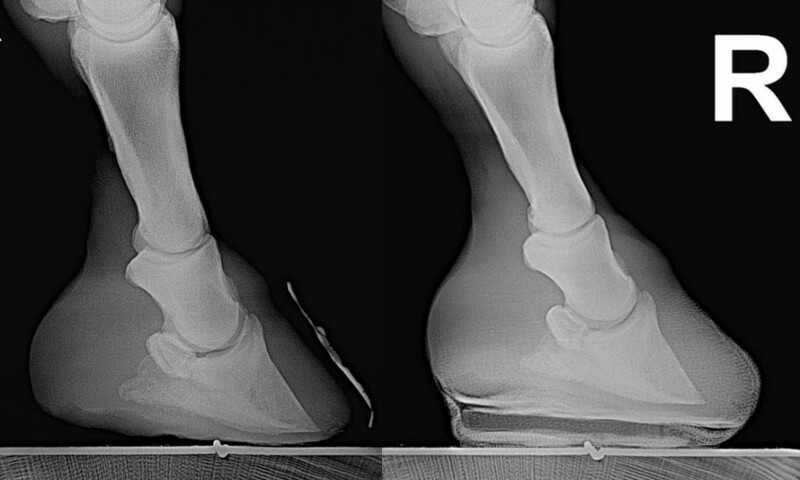 Xrays show how Equicast with a toe relief pad moves breakover back and lifts the painful thin sole of a foundered horse out of ground contact. ThinLine pads are made of breatheable engineered open-cell foam with a cross-ply layered structure. 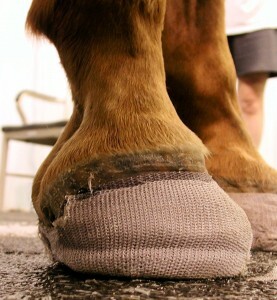 They act as a surrogate for missing or deficient natural padding or protection, substituting for protective sole callous layers for horses with thin soles, and providing shock absorption for horses with heel pain from underdeveloped digital cushions. Or contact me to learn more about how Equicast can help your horse.